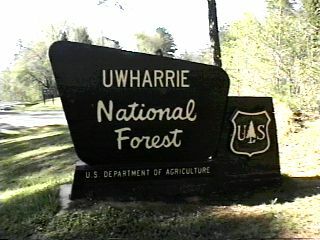 There will be an open Volunteer Work Day this Saturday, May 16th at the Uwharrie National Forest. Meet at the Hunt Camp at 9am. This is part of a long term on-going project where each month folks from around the area put forth volunteer time to maintain the trails inside of our national Forest. This park is also the first recipient of an SFWDA Grant last year when the gravel entry roads were updated with loads of fresh rock purchased by your association. The dedication from these volunteers and our direct contributions are about the only thing keeping these trails open. Come on out and support this effort. "Here’s the plan for this month. 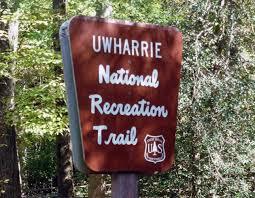 Meet Joel at the Uwharrie Hunt Camp at 9 am and get signed in. Continue with the installation of guardrail on Daniel Trail. These sections have been flagged already by Joel, Darin & myself. These are the sites labeled A & B and the section in-between A & B that is to be slashed in. The guardrails and posts are on site already so once every meets up and gets signed in with Joel you’ll all be able to head out to the Daniel Trail. The slashing in of the ridge line will take folks with winches that can winch trees a ways from the trail and then basically line them along the edge of the trail to make a boundary to indicate where the trail really is. We have gotten a big supply of our fiberglass / carsonite signs in so I’ll have them ready with the “No Vehicle” signs to be put up behind the slash & guardrail and in the illegal bypasses. We appreciate your help and continued support on the trails."